Glaucoma is the name given to a group of eye diseases in which the optic nerve at the back of the eye is slowly destroyed. It is characterised by damage to the optic nerve which causes peripheral vision loss. Glaucoma occurs when the normal fluid pressure inside the eyes slowly rises. However, with early treatment, you can often protect your eyes against serious vision loss. Treatment for glaucoma aims to lower the internal pressure of the eye and prevent any loss of vision, or any further deterioration in vision. In adults, treatment cannot restore eyesight that has already been lost as a result of glaucoma. Treatment options include medications (eye drops), laser treatments, and surgery. When treatment with medications does not successfully lower pressure in the eyes, laser or surgery treatments need to be considered. However, in some instances it may be appropriate to use laser or surgical treatments first, particularly in moderate to severe cases. Surgery for glaucoma is usually needed only if you continue to lose vision and the pressure in your eyes cannot be lowered with medications or laser treatment. Glaucoma is the name given to a group of eye diseases in which the optic nerve at the back of the eye is slowly destroyed. It is characterised by damage to the optic nerve which causes peripheral vision loss. Glaucoma occurs when the normal fluid pressure inside the eyes slowly rises. However, with early treatment, you can often protect your eyes against serious vision loss. Everybody's eye produces a fluid like water known as aqueous humour in its middle chamber. 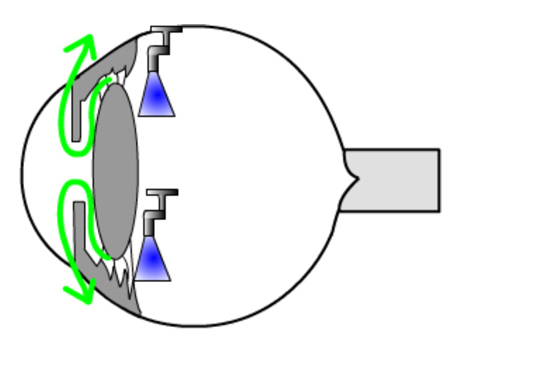 This fluid then flows around inside the eye to the front chamber, as shown in the diagram below by the green arrow. Normally fluid is made in the ciliary body and circulates to the front chamber, where it drains through the trabecular meshwork out of the eye, like the drainpipe of a sink or bath. From this drainage system the fluid enters the bloodstream. The trabecular meshwork is a type of filter system. In the common type of glaucoma this drainage system can block. The fluid gets trapped in the eye, and the pressure inside the eye goes up like a tyre being blown up too much. This pressure or fluid then presses on the nerve at the back of the eye. If the pressure is high or continues for a long time, usually years, the nerve at the back of the eye may become damaged, and eventually the sight may be affected. The pressure reduces the blood flow to the tiny blood vessels in the optic nerve. This is also called primary open-angle glaucoma and is the most common type. Over time, the drainage channels through which the aqueous humor flows slowly become blocked. The pressure within your eye rises very slowly so that any damage to the nerve and eyesight happens gradually. In chronic glaucoma the drainage angle of the iris is normal, unlike acute glaucoma (see acute glaucoma). Normal-tension glaucoma can occur when the pressure in the eye is within the normal range. It's thought that a poor blood supply or a weakness in the optic nerve may make the nerve more likely to become damaged by normal eye pressure. This is also called narrow-angle glaucoma. It occurs when the drainage angle of the iris narrows, preventing the aqueous humor from flowing into the drainage (outflow) channels. This can be painful and causes permanent sight damage unless treated quickly. The increase in pressure can be two or three times the normal eye pressure within an hour or so of the iris narrowing. This type of glaucoma is rare. This occurs as a result of other eye conditions. It can develop after an eye injury or if you suffer from repeated inflammation in the eye. This is a very rare condition where a baby is born with glaucoma. The condition occurs when the baby's normal vision is still developing. Even if it is treated, congenital glaucoma sometimes causes blindness, often because it is difficult to diagnose. Ocular hypertension is a condition where the pressure increases moderately but there are no signs of loss of vision or optic nerve damage. This needs to be monitored as it can occasionally lead to optic nerve damage over time. If you have chronic or secondary glaucoma, ocular hypertension or normal-tension glaucoma, you probably will not notice any problems until your vision has deteriorated quite considerably. This is because the first part of the vision to be affected is the outer or peripheral field of vision. Central vision, used to focus on an object (eg. when you are reading) is usually not affected until relatively late on in the disease. There are a number of tests which need to be performed to diagnose glaucoma. Glaucoma can not be diagnosed solely on the intraocular pressure measurements. During your visit to Clearsight Eye Centre some of the following tests will be performed. A tonometry test measures the pressure inside your eye, which is called intraocular pressure (IOP). Tonometry measures IOP by determining the resistance of your cornea to indentation. Eye drops to numb the surface of your eye are used. IOP is measured as part of a routine eye examination. It will be performed at every visit to monitor treatment for glaucoma. Gonioscopy is a quick and painless test that allows us to directly observe the health and condition of the angle where the iris meets the cornea. By directly observing the angle and its status we can understand more about whether you are at risk of the angle becoming closed or whether the trabecular meshwork appears to have a normal anatomical structure. A visual field test measures how much 'side' vision you have. It is a straightforward test, painless, and does not involve eye drops. Essentially lights are flashed on, and you have to press a button whenever you see the light. Your head is kept still, and you have to rest your chin on a chin rest. The lights are bright or dim at different stages of the test. Some of the flashes are purely to check you are concentrating. The computer will then plot an actual map of your field of vision so that your eye doctor can interpret this map in conjunction with other examination tests in order to understand how well your optic nerve is functioning. This measures the thickness of the cornea or the clear window covering the coloured part of the eye. This test is generally only required once. The Pachymetry Test is a simple, quick and painless way of accurately measuring your corneal thickness. The test is performed by first placing some drops in your eyes to make sure they are numb and then lightly touching the cornea with a “pencil like” probe that uses sound waves to precisely measure your corneal thickness. Corneal thickness is important because it can alter the accuracy of the measurement of intraocular pressure, potentially causing doctors to delay necessary treatment in some cases or causing doctors to treat normal people unnecessarily in other cases. Your actual intraocular pressure may be UNDERESTIMATED if you have thin corneas and it may be OVERESTIMATED if you have thicker corneas. Retinal Nerve Fibre Layer Defect, which may present many years prior to visual field damage, is an important sign of primary open-angle glaucoma. Early diagnosis has been emphasized in the treatment of glaucoma. 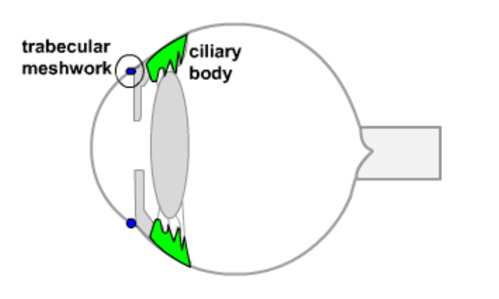 The OCT is an instrument that is capable of creating digital images through the use of special beams of light in order to create a contour map of the optic nerve and measure the retinal nerve fiber thickness much in the same way that a CT Scan is able to digitize and analyze tissues throughout your body. The goal of the OCT is to allow your doctor to detect the slightest loss of optic nerve fibres at the earliest possible time in order to diagnose glaucoma and stop progression of the disease, so as to preserve your vision. The OCT is also used to monitor progression of the condition, if it has already been diagnosed and treated. Photographs are taken of the optic nerves. The appearance of the nerves is also an indication as to the presence and progression of glaucoma. In many cases we can do stereo photos to give a better 3D view of the optic nerve head allowing the doctor to compare the appearance from each visit and see if there are any structural changes which can indicate loss of field of vision. This is a very quick, and painless procedure. The patient stares at a target inside a camera lens and a photo is taken. If the patient's pupils are large enough, there is no need for eye drops to dilate the pupils. Treatment for glaucoma aims to lower the internal pressure of the eye and prevent any loss of vision, or any further deterioration in vision. In adults, treatment cannot restore eyesight that has already been lost as a result of glaucoma. Treatment options include medications, laser treatments, and surgery. When treatment with medications does not successfully lower pressure in the eyes, laser or surgery treatments need to be considered. However, in some instances it may be appropriate to use laser or surgical treatments first, particularly in moderate to severe cases. Medications, usually eye drops, are used to lower IOP by either decreasing the amount of fluid produced by the eye or increasing the amount of fluid that drains out of the eye. It is important to understand that treatment for glaucoma will most likely continue for the rest of your life. Once you start treatment for glaucoma, you will need regular eye examinations. Once the target pressure is reached, you may need to see the doctor every 3 to 6 months. The ophthalmologist will examine your eyes for changes in the optic nerve that indicate the disease is getting worse despite treatment and will adjust the target eye pressure if needed. If the pressure in the eye continues to be high or if damage to the optic nerve gets worse despite treatment with eye drops, laser treatment may be done.